Remembering Jim Condon | UNL Band Alumni Association, Inc.
James L. Condon, age 70 years, passed away January 14, 2018 in Republican City. Jim was born on July 6, 1947, in Aurora, to John and Hazel (Olsen) Condon. He graduated from Aurora High School Class of 65 and University of Nebraska with a Degree in Chemical Engineering. Every year he enjoyed marching with the UNL alumni band. In 1970, after graduating from UNL, Jim and Shirley Moller were married and they spent 47 years together. Jim served as a military intelligence officer in the United States Army, four years on active duty, and ultimately retired after 30 years as a Lieutenant Colonel in the Reserves and National Guard. In recent years he was actively involved with ROTC and the Pershing Rifle alumni to encourage increased student participation in these important programs. Jim had recently celebrated 40 years at the job he loved with the engineering and design firm Olsson Associates where he served as Vice President, Public Relations in the area of water and wastewater. He had significant volunteer service and involvement in the Water Environment Federation including the Public Communications and Outreach Committee, Chair, Stockholm Junior Water Prize, and the National Boy Scouts of America Jamboree. 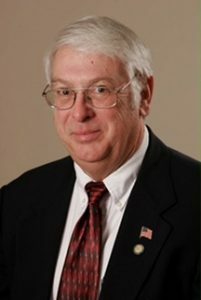 He was also a member of the Nebraska Water Environment Association and the American Water Works Association. Jim loved being with people and that carried from his professional face-to-face interaction with clients to a very full social life. He was known by so many for his times with the Eagles, Elks, American Legion, VFW, and Old Dominion Boat Club. He was an avid supporter of statewide shuffleboard and pool tournaments and activities. Jim also had a passion for the outdoors and loved fishing, boating and golf. Jim is survived by his wife Shirley of Lincoln, daughter Micki (husband Bill) Fowler of Lincoln, son Michael (wife Julie) Condon of Portland, OR, 2 grandchildren Starr Fowler and Kinsley Condon, sisters Sharon Nell of Satellite Beach, FL and Cindy (husband John) Powers of Kapolei, HI, mother-in-law Marilyn Moller Brennan, nieces and nephews. Memorials are suggested to University of Nebraska Foundation/ROTC Stockholm Jr. Water Prize.